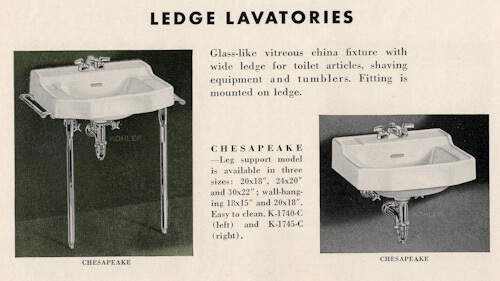 Today, a geeky story: The correct technical names (I think) to describe the distinct design styles of vintage bathroom sinks back in mid century America from the 1940s to 1960. In the auto industry, you would call these “body styles.” Looking at the shape of the mold used to create bathroom sinks, I count seven basic design variations, and show six of them in this story. 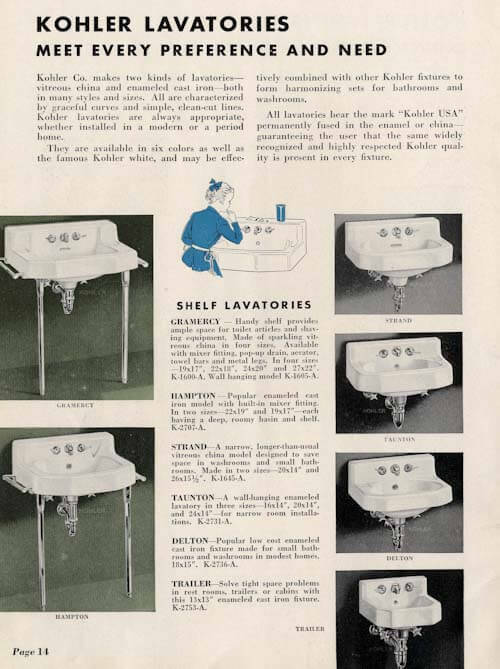 Maybe these descriptors are still used in the bathroom industry today? 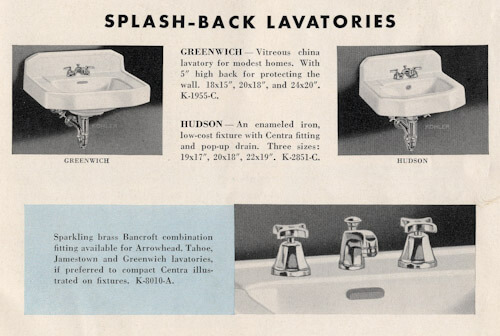 All the images in this story come from a 1954 Kohler plumbing fixtures catalog in my personal collection. Before I jump in, a discussion of the term “lavatories”. I am pretty sure that a lavatory is a meant to describe a sink in which you wash your hands or face. Not dishes. All lavatories are sinks. But not all sinks are lavatories. In this story, I will refer to them as sinks, since I don’t think too many people use the old school name any more. But it’s cool to know the difference. 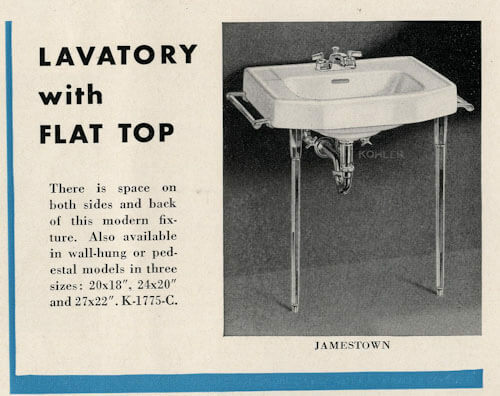 I was looking at another catalog, which seemed to suggest: A “washroom” is a room that includes a toilet and a sink — what we today commonly call a “half bath.” A “bathroom” dials up that definition to include a bathing receptable (what we would call a “full bath” today). Back in the day, once plumbing fixtures started going into toilet areas, homes first installed a bathroom. Many — probably most — houses had just one, full bathroom. 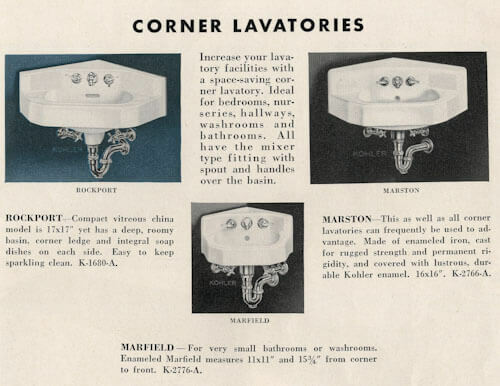 As prosperity grew, washrooms were marketed as an add-on: As in, install a washroom (half bath) for visitors to use and to save steps. Above: I’m taking poetic license now. Forget that this is a corner sink, as per the Kohler page. I am calling this a slant-back deck sink because of the way that the faucet installs. I recently did a story on where you can still find slant back faucets. 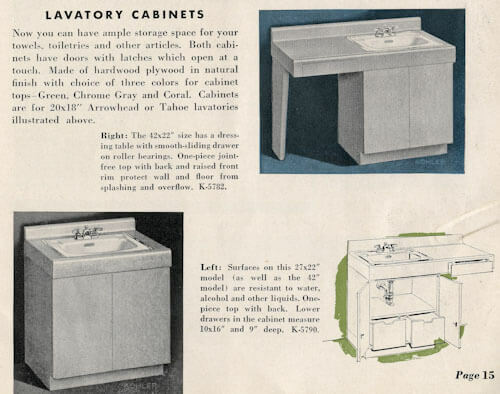 Above: Kohler is calling these sinks for “building in”. I am queen of this page, so I call them “hudee rim sinks” reflecting the fact that they require a stainless still rim, or ring, to cover the edge of the sink where it meets the counter top material. There are no tile-in sinks shown in my catalog. I *think* that these require yet another design or mold: The edge of the sink sits as high as a thickness of tile, so that it can be tiled in seamlessly. Above: A ledge sink looks to be evolved from the shelf sink. The faucet sits flat on the deck and takes up space there, so there is not so much storage space. Above: Splash back sinks are pretty. They have an integral back splash. I believe this look was a hangover from Victorian and early 20th century designs. 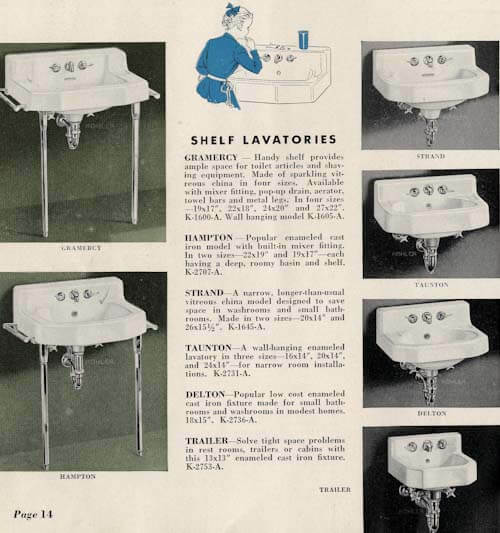 I do not believe sinks that sat on top of the counter (sans hudee) were common until the 1960s. The slicing and dicing in this story stops around then. Sinks may have been made porcelain-enamel-on-cast iron, porcelain-enamel-on-steel or all china porcelain. Sinks may have sat on a single china pedestal or on legs, have been set in a vanity, or have been wall-hung. Legs were typically chrome, although we have seen other designs. I remember one that looked like scrolled wrought iron, as I recall. There were a few designs that were quite wide — 36″ — and incorporated, essentially, counter top space to the right and left of the wash basin. They sat in special vanities, were wall-hung, or sat on legs. For example: The American Standard Gracelynn. There were also sinks designed to protrude from a vanity counter top, they were hudeed in, or tile-in. Sinks may be corner sinks — and I tend to believe that corner sinks may have had any of the deck designs — shelf-, ledge-, flat-, slant-, or splash-back. 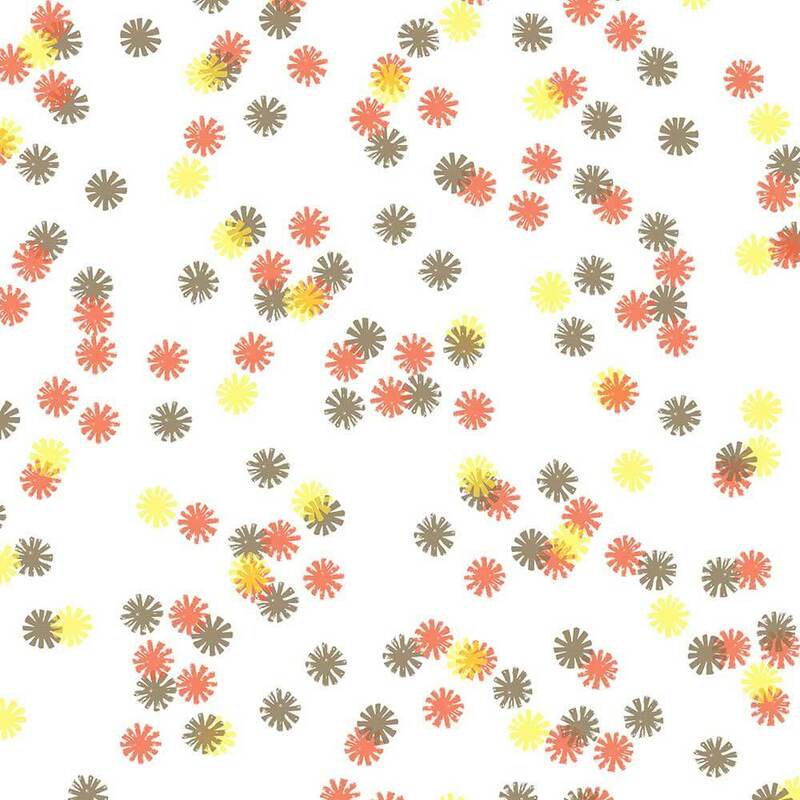 Maybe not so much tile-in or hudee-ringed; but who knows. Some vintage sinks had integral faucet spouts — like the Henry Dreyfuss-designed Cranes. These also may have had different deck designs. 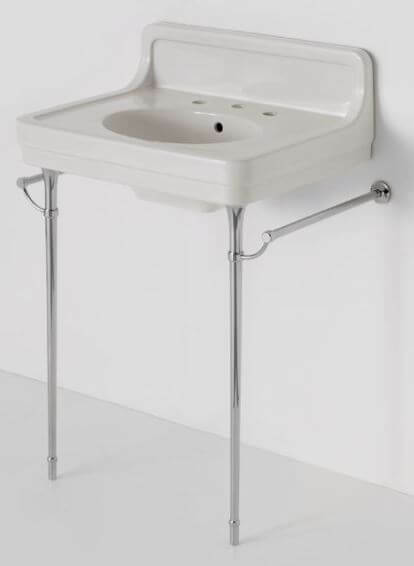 Further, I will put dental sinks intended for residential use into their own category. Some of these even delivered water from under the rim to clean out the sink after. I will stop at the end of the 1950s for purposes of this analysis. Starting in the 1960s (I’ll guesstimate) we began to see even more one-piece sink/counter tops designed to plop right down on a vanity. There was push-button plumbing. And maybe more innovations. 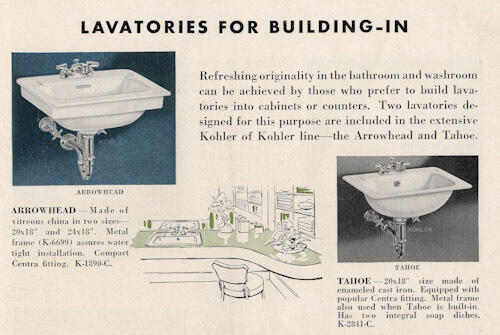 I need to find some Kohler catalogs from that period! Are my geeky lists correct and complete? I have a Kohler Hudson in my bathroom, with a late model cheap faucet installed by the previous owners. I’m trying to find a faucet that at least looks correct, but I can’t very well see what the original looked like in the pic. Could anyone point me in the right direction? I’m confused by your repetitive use of the word “geeky.” This is information that those interested in restoring a bathroom would find useful. That’s why I’m here. I see the word as a positive!